Keywords are a matching mechanism in SEO. They are an indicator to Google that you understand your customer’s needs, and make it more likely that Google will send that user to your site for answers. But SEO is more than keywords. Google is also watching what happens once the user gets to your site as well. Have you provided relevant, useful content to your human users? Have you structured your content in a way that’s easy to understand? The presentation and organization of your content makes a huge difference to how it will be received. There are some good commonsense rules of thumb to help you organize your content better. Let’s look at those in Episode 139. Listen to it here, in Apple Podcasts, or in your favorite pod player. If you’re new to this series, the first episode is SEO: A Different Approach | The 5 Key Factors. 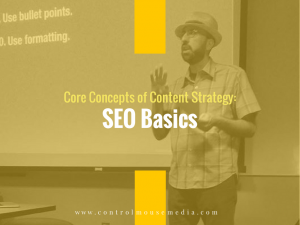 To go further in learning the basics of SEO, I have an online course to teach you the techniques that I use with my clients. I publish new episodes of this podcast most Mondays – subscribe here if you want me to ping you when new episodes are available. I offer free help with content marketing in my podcast and blog for small business owners of all types, including freelancers, writers, and other creatives. If you are able, fuel my efforts with a cup of coffee!